Achieving the goal of the participant that will navigate and the safety of the participant student and the crowd around the area will always be first than the passion of the sport by taking the basic security methods seriously. These rules are necessary for a good healthy practice of the sport. 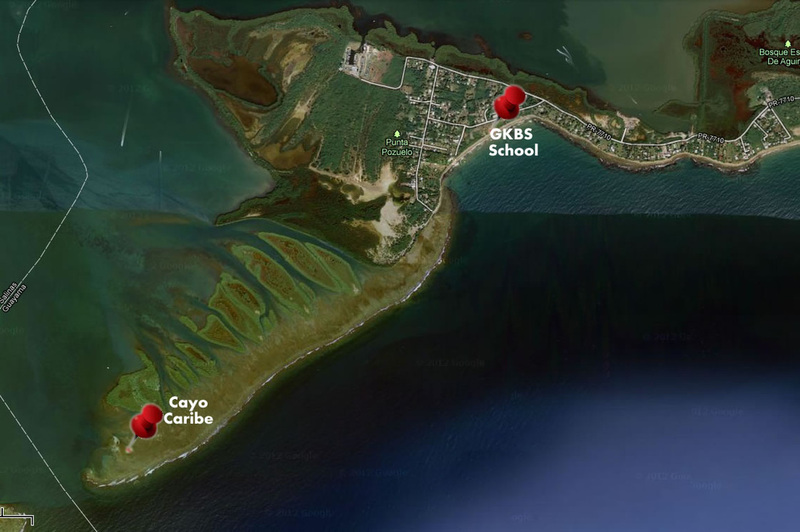 The approach of Guayama Kiteboarding school is security. 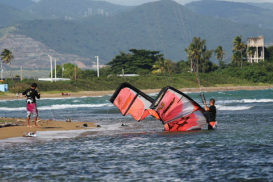 Our south coast specifically Pozuelo a sector in Guayama Puerto Rico, which we offer kite boarding courses is a perfect gift of nature, great wing and a perfect coast for practicing kite boarding. We have a natural area (flat water) of shallow water for beginners, besides a suitable area for the basic practices of this great sport. A difference from other beaches this area is not suitable for swimmers allowing us to only share the coast with surfers who are our allies in the water because they help us each time we need assistance. We have steady wind most of the time 23+ MPH = 20 Knots + We have a Premium Weather Station. In addition; showers, gazebos for the family, food kiosk, big parking lot and an instructor every weekends and festive days. Now both local and visitors have the opportunity to learn and improve in an exciting sport. What is KiteBoarding o KiteSurfing? This sport can be practiced by all kind of people Example: Tall, small, obese, skinny and disabled and so on. People without one arm, one leg, or both legs can practice this sport with a few modifications but if the person is decided to learn it no one can stop it. This can be a great opportunity for our school to become a pioneer in these characteristics. For every person described above a suitable kite is chosen by weight, wing and practice zone. The average age to be in my school is from thirteen to one hundred is your body can support it. If your age is not above thirteen, your parents need to be in the area and support the child. This is a family sport so be in family counts. Watch this video as two KITE RIDERS have this condition. *Work packages to Caribbean Cayo, Flat Water Kite in Guayama Puerto Rico. -Group of 6 people maximum. -He cooks the food, the group will provide food. chef included. -Instructor kitesurfing or kiteboarding included. *Also if you are looking only for transportation and instructor assistance KiteSurfing sport, there are also more economical packages. *The Guayama kiteboarding school invites you. Focus on safety and proper handling of the equipment. Basic lessons to control the kite include theory, security, control techniques, power zone, simulation to start in water and the techniques of the area that we practice. - Security of the swimmers and the persons around. - Body drag assistance and body drag assistance only. Equipment to be used, trainer kite Harness. Will be in the water; learn to land and to take off, water re launch, self rescue techniques, drifting (body dragging), start the basic techniques in water and emergency release of the equipment. - Release techniques and security. In this class you will learn to go faster, how to improve your posture, the site of the kite, redirection, security practices, power techniques and upwind. .